It's Barb and I am back to host the Quick Quotes Blog today! I was lucky enough to receive the October Club Q kit to work with this month and let me tell you.... it is amazing! The mini album that comes in the kit is fabulous! It could be used for so many themes. I chose to make my mini about my husband and I. We have been so fortunate to do a lot of traveling. I thought it would be fun to put a lot of those photos in one place. The chipboard gate is from Bag O' Chips - Garden. I inked it with PowderPuff Chalking Ink in Mocha Mama, misted it with a glimmer mist and then embossed it with clear embossing powder. This month's kit comes with several die cut flowers. I used those flowers and leaves for the cover. 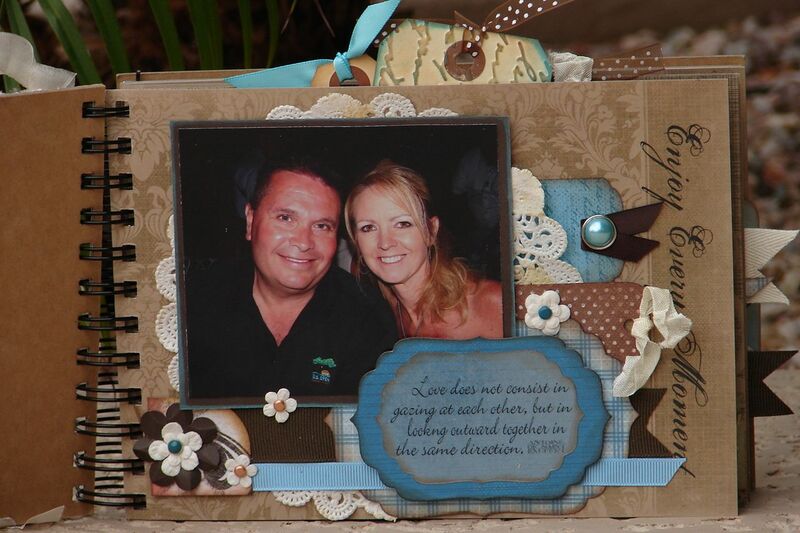 The vellum quote I used on this page is from the Sentiments Itty Bitty Box of Vellum Quotes. 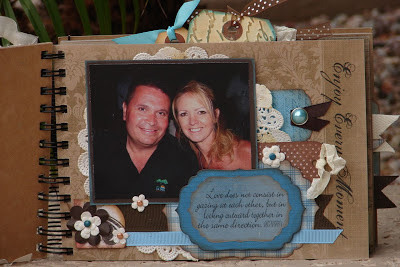 I used my Spellbinder to cut the shapes and layer them. I had these picture from Cabo that were a little (okay a lot) more casual so I added a burlap strip and then burlap leaves. I also added some tags that I could journal on because there is a really funny story that I want to be able to tell with these photos. I added some stitching to the banners on each page to help give them a little dimension. I then tucked a tag under each photo and used letter stickers to state where each photo was taken. The vellum quote on this page was torn, inked and then mounted on a piece of ribbon. I used a strip of paper that I inked with brads to hold the vellum on the ribbon. There is so much more I could make with the supplies I still have left from this kit! If you have been thinking about joining Club Q, this is definitely the month to join! Thanks so much for spending a moment with us here today at Quick Quotes! Such a gorgeous mini album Barb!! I Love it. Fabulous mini. Love the stitching details and the vellum on the ribbon is so clever. Great job! Fabulous mini!!! So many precious details...obviously alot of time and thought went into this!! What a wonderful mini album! Love the stitching detail. Gorgeous!! Definitely alot of time spent and it shows! :) Beautifully done. 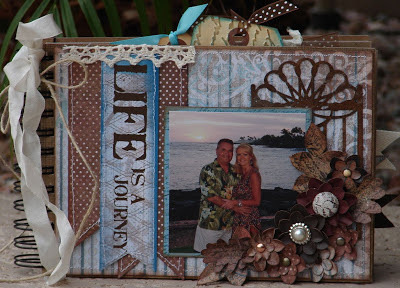 Wonderful embellishing & memories. Thanks for wonderful giveaway chance. Love how you used the mini album - really fantastic!